The weeds of the field and garden have two big advantages in the kitchen: firstly, they are free to anyone; secondly, they contain any amount of dietary goodness, often not so readily available from the anaemic products of the hothouse and intensive farm. And what is really needed is a set of recipes to turn them into everybody’s favourite supper. This Vivien Weise provides in spades. With plenty of clear illustrations of the plants in question – ensuring that every reader will be able to identify the quarry when out gathering – Vivien has created a series of vegetarian dishes (all the recipes are meat-free) with a defiantly modern slant: comfrey hamburgers, daisy ginger soup, dandelion salad with a banana yoghurt sauce, dead nettle aubergine spread, ground elder layered pancakes, and many more. The great charm of this book is that you can go into the vegetable plot with two baskets: one for dinner and one for the compost heap. While gathering your supper, you weed the garden. 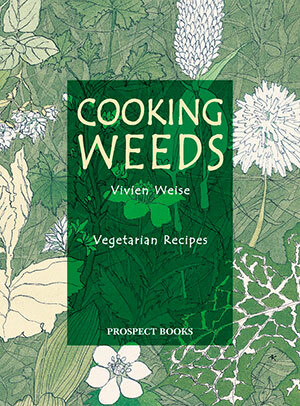 In the popular weed-cookery courses that Vivien gives at her home in Germany, she demonstrates the culinary value of upwards of a hundred different plants. The value of weeds is a given in Mediterranean countries where wild-plant salads are commonplace. It was also understood by our own ancestors who recognised that many of these plants – now derided as pests – might actually taste nice (stinging nettle soup is but one hangover from this era), and that they also had great therapeutic value: the lesser celandine, for instance, was a particular remedy for scurvy; the dandelion is a diuretic. They also have very high vitamin, mineral and protein content, especially in comparison with cultivated vegetables. For example, the dandelion has 3.3% protein per 100g (the lettuce 0.9%); ground elder has 684mg of vitamin A per 100g (broccoli 370mg); Good King Henry 3.5mg of iron per 100g (swiss chard 2.2mg). Vivien Weise also writes travel books and has camped, cooked and visited all the world’s continents. She now lives in Germany where she gives courses in weed cookery to an increasingly appreciative public. A PDF of the preliminary matter of Cooking Weeds, together with some pages of recipes.